Surya 24 Movie Audio Launch / Release: Suriya’s “24” is a science-fiction movie about time travel. This film is written and directed by Vikram Kumar. Features Suriya, Samantha and Nithya Menen in the lead roles. Suriya himself has produced the film under his home banner of 2D Entertainment. 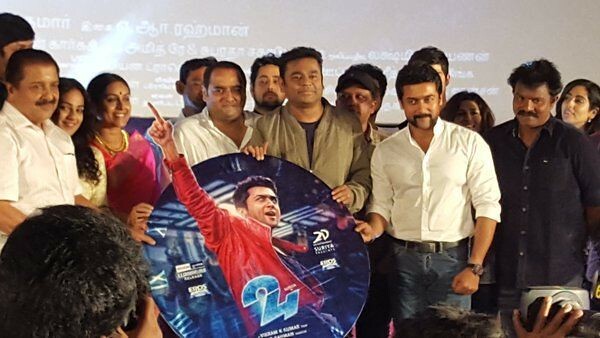 The audio release of 24 movie released on April 11th for both Telugu & Tamil versions. The audio release of the 24 Tamil version released at Sathyam Cinemas, Chennai from 9am while Telugu version is going to be revealed at Shilpakala Vedika, Hyderabad from 6pm onwards on April 11, 2016. Check out the below article for more information regarding Suriya‘s 24 Movie Audio Launch Live Streaming, Release Date, Venue and other details. Surya 24 Movie Tamil, Telugu Trailer Free Download Youtube 3gp, MP4. 24 Tamil Audio Launch Date: 11th April, 9am onwards. 24 Tamil Audio Release Function Venue: Sathyam Cinemas complex, Chennai. The officials are not yet confirmed the TV Screening of 24 Tamil Movie Audio Release. We will update the links when info is available. Here we are giving links to watch the Live Streaming of Suriya’s 24 Tamil Movie Audio Launch Event. Click below link to watch the live streaming of Suriya 24 Tamil Movie Audio Launch. 24 Telugu Audio Launch Date & Time: 11th April, 6pm onwards. Here we are giving youtube video links to watch the Live Streaming of Suriya’s 24 Telugu Movie Audio Launch Event. Click below video to watch the live streaming of Suriya 24 Telugu Movie Audio Launch. Producers: Suriya & K. E. Gnanavelraja. Music Director: A. R. Rahman. “24” is a science-fiction movie, written and directed by Vikram Kumar and produced by Hero Suriya. Samantha and Nithya Menen are in the female leads in the flick, which will hit the screens on last week of April or the first week of May. Hope you like this, Suriya‘s 24 Movie Audio Launch or Audio Release Date, Place, Venue, Full Video Live Streaming in Youtube, Jukebox, and Full Track List info. If you like this, then please share it to your friends.